Our facilities are winterized. This means the only restrooms available will be in the vault toilets. Power will be on throughout the winter. All of the campsites have been remodeled. Sites 1-10 are very similar to what you remember from the past. Sites 11-20 NOW HAVE ELECTRICITY HOOKUPS. They should also be bigger than in the past and more RV friendly. The boat ramp and docks are out of the water on dry ground. ICE CONDITIONS: Ice is good on the majority of the reservoir. Near the dam near the middle of the reservoir there is some new ice coverage which might be thin. Millsite Reservoir is in Castle Valley (Emery Country) at the mouth of Ferron Canyon. It is a large impoundment of a midelevation desert at its interface with high, mountainous plateaus. 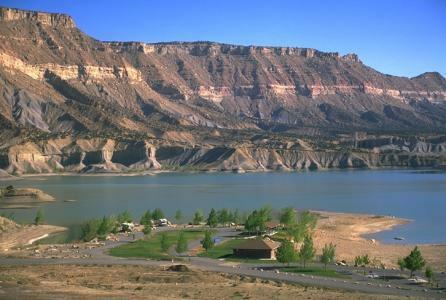 It is one of several large reservoirs on the east slopes of the high plateaus of central Utah, so it does not receive a great deal of recreational use, although there is a state park at the facility. High bluffs at the mouth of Ferron Canyon provide a spectacular backdrop to the reservoir. The reservoir was built in 1974 by the construction of an earth-fill dam. The shoreline is owned by a number of different agencies, including the BLM, the State of Utah, the Ferron Canal and Reservoir Company, and possibly some private individuals. Public access is somewhat restricted. Water is consumed for irrigation, but also used for recreation and coldwater aquatic habitat. Millsite is a state park, located west of Utah Hwy. 10 in Ferron City on Canyon Road (100 South). Facilities include a boat launch, picnic pavilions, showers, flush toilets, drinking water, a sandy beach, and 20 campsites. An intriguing nine hole golf course is adjacent to the park.